The June issue of our newsletter is now available online and should have arrived to your mailboxes on Thursday the 24th of May. In 2006 the Standard Operating Proceedures for Electrochemotherapy (SOP for ECT) have been published, and they have since greatly facilitated the ECT for treatment of tumors. 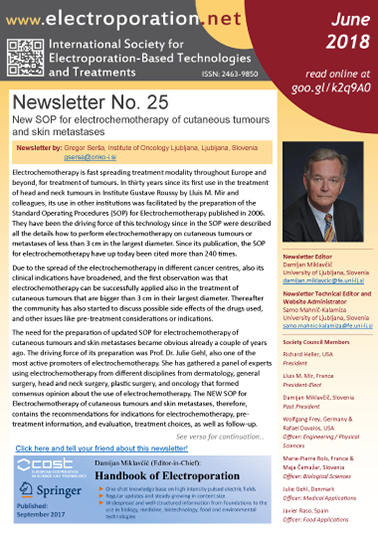 Recently, new and updated SOP were published, prepared by a group of experts and experienced users of electrochemotherapy. Gregor Serša, one of the authors, is describing this in the this issue of the ISEBTT Newsletter. There’s also a new feature that has been added to the ISEBTT portal isebtt.electroporation.net due to the requirements of the new EU Directive called GDPR. It allows you to specify your communication preferences, correct the data we have on you (if you are on our mailing list) and request deletion of all your data in case you would like us to cease retaining your personal data in our database. To view the My Profile interface where you can take care of all of this, sign into https://isebtt.electroporation.net/myProfile using your username and password. If you’ve forgotten them or never have received your credentials, you can click Forgot password? and have your credentials emailed to you. The PDF is available from the newsletters archive or directly below.